Hello! Peggy here and I am excited to show you my altered windchime now a fabulous steampunk bird windchime. I started with my wooden pieces that I painted with white gesso. I took separate pieces of cardstock to stamp my bird images on with versa mark ink and embossed in white and black. I adhered the embossed cardstock to five wooden birds and stamped images on the back of the wood. I alternated black and white on either side. I strung my birds with fishing line in different lengths to fill in the mobile/windchime. 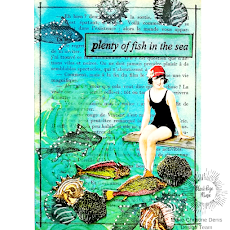 I hope you enjoyed my short tutorial and I encourage you check out Sin City Stamps for your chipboard, wooden pieces, stencils, stamps and more!! This is wonderful. I would love to have this hanging in my back yard, or better yet, my studio!!! !